Way back in the late 1970s class 40s were my favourite locos and I fondly remember seeing them working freight trains past my school in Norton and passenger trains through Darlington. Even trips to Scotland to visit relatives would have me spotting them passing Carmuirs West on trains to the North. Back then I had a Jouef class 40 which I can charitably say was challenged in both looks and performance. Next came along the Lima 40 which although being many times more accurate than the Jouef model was still fairly compromised, mainly around the cab area, but in a couple of other areas too, and with the usual Lima pancake motor performance wasn’t brilliant either. I had the version that represented the small batch of disc fitted locos converted to centre headcodes during the 1960s (D260-D266) and also along the way picked up a centre headcode and three disc fitted bodies. When Bachmann had a stab at producing a model of the 40 you got a model with a nice powerfull chassis but the body was arguably worse than the Lima one. The cabs undoubtably looked better than the Lima ones but between the cabs things had gone quite badly wrong. The cantrail grills were too low which meant the height of the bodyside was something like 1.5mm too shallow. The talk amongst the finescale fraternity back then was that the Lima body could be used on the Bachmann chassis to get somewhere towards a reasonable model so I acquired a cheap Bachmann 40 and sold on the body. 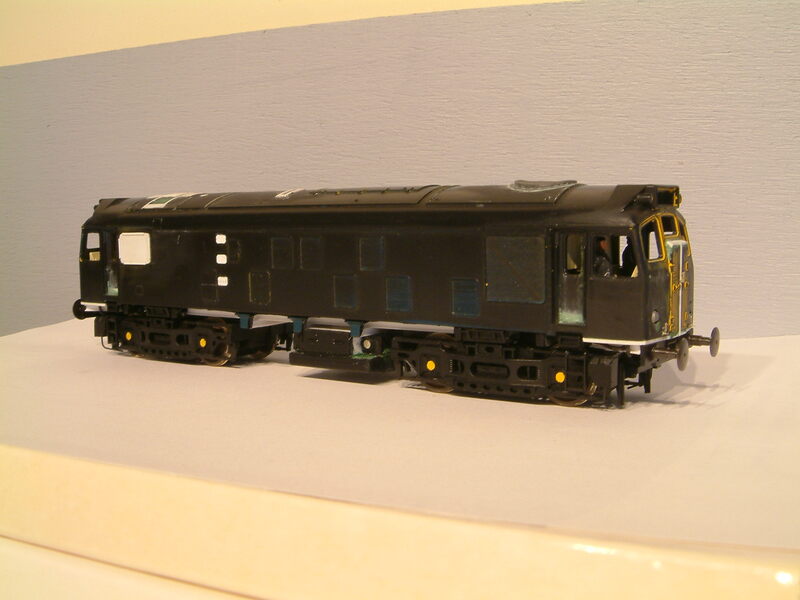 Further chat on the forums then suggested that the Bachmann cabs could be grafted onto the Lima centre section to finally get something approaching a decent model so I bought another Bachmann body and set about converting the Bachmann chassis to P4 with Black Beetle wheels. Sadly, no matter what I tried the rewheeled chassis just wouldn’t stay on the track on Longcarse West so I put all the bits back in the drawer and got on with converting more secondhand Heljan 26s and 27s. Fast forward to the begining of this year and with the new, revised, Bachmann 40 being imminent my thoughts turned back to class 40s. One of the new locos was going to cost me 88 quid from Hattons and it would still need to be converted to P4 and have the windscreens and radiator fan replaced with the Shawplan etch. Total outlay would be about £130ish which is an awful lot to a cheapskate like me. On the other hand, I had five Lima bodies, one Bachmann body and a chassis already badly converted to P4. With a bit of outlay on some Shawplan bits, a new saw blade and another crack at the chassis I could have the ultimate 40 for a lot less cash then the new Bachmann effort. Bachmann cabs onto Lima centre section and if I couldn’t get the chassis to work I could splash out on a Runmey Models sprung chassis. Bish, bash, bosh, job done. Or so I thought. With the Bachmann cabs cut off the body and screwed to the chassis one of the Lima bodies had it’s cabs removed and had it’s length trimmed, mostly from the boiler end as it looked a bit long compared to the drawings I had available, until it dropped nicely into place. To make things complicated for myself I then decided I would model one of the Scottish centre headcode conversions so I chopped the noses off the appropriate Lima body and the Bachmann cabs. The Lima noses are about 1mm too tall so they were cut just below the headcode box, reduced in height to suit the Bachmann noses, and glued on. I also cut some cantrail grills from one of the spare shells to change the cantrail grills at the no.2 end to the Clayton pattern of long-long-short. 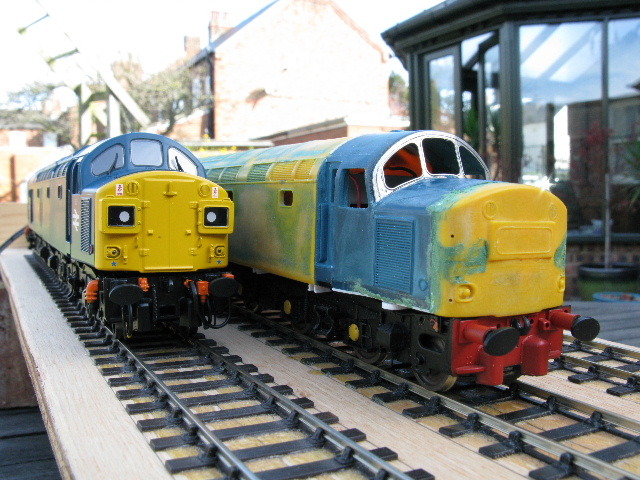 The chassis of both locos will be upgraded and detailed with reference to the excellent article on class 40s by the Mostyn crew in the December 2005 issue of Rail Express Modeller. Bachmann have left off a lot of detail here between the body and bogies to allow the loco to go round trainset corners but for a finescale model it can safely be added without any fear of it getting in the way. The hybrid loco has had it’s inner sandboxes and multi working gear removed as per the prototype while the new Bachmann one, which will become Haymarket allocated 40142, will need attention to the oversized bogie side MW gear. With the Bachmann fronted Silver Fox cabs attached to the Bachmann body I sat back and had a good look at it. 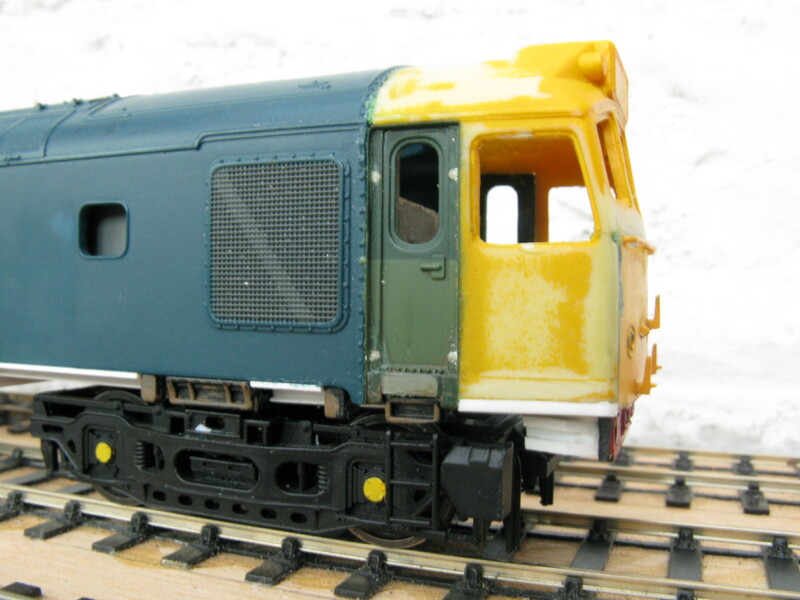 It struck me that the Silver Fox cab doors (copies of the original Hornby ones) didn’t look too brilliant with poor door handles and the windows looked a bit on the small side. I came to the conclusion that the Bachmann doors are better and if I’d thought it through properly before starting cutting I could have kept the Bachmann doors. Luckily I had a spare body so I cut the doors from it and the SF cabs, filed them until the were a good fit and araldited them into the new body. The handrail holes at 0.7mm were far too big so were filled with 30thou rod and will be redrilled later for new 0.33mm diameter nickel silver handrails. Having learned my lesson I’ll make sure all future 24/25 conversions keep the Bachmann doors from the beginning without having to sacrifice spare shells later in the build. The chassis has been chopped around pretty much as per the Jim S-W method although I’ve managed to keep the chassis frame complete without removing the buffer beam and cab floor by adding some 2mm square reinforcement between the bogie pivot and the cab side where the cutting away doesn’t leave much of the original chassis behind. I also reinforced the main chassis frame between the bogie pivots with more of the 2mm square Evergreen strip. Other additions to the body are strips of 20 thou strip along the bottom of the bodyside between the body mounts and a representation of the chassis frame below the cabs. These will need a little more fettling as now I’ve reassembled the loco I can see there is going to be an issue with bogie swing. That’s pretty much it for now with this loco. It’ll need a Shawplan roof grill and a little work on the Bachmann lamp irons to refine them and then I’ll have to select which loco it’s going to be so that the detail can be correct for a loco running in Scotland in 1975. 25108 looks favourite at the moment but it depends on which loco I can find decent photgraphs of. Time to hit the book collection and the internet I think. To model a 25 with the later bodyshell there are a few options. In the olden days of the 1980s and 90s A1 models used to make a kit which included etched bodysides and cantrails and you had to modify the front of the loco yourself. 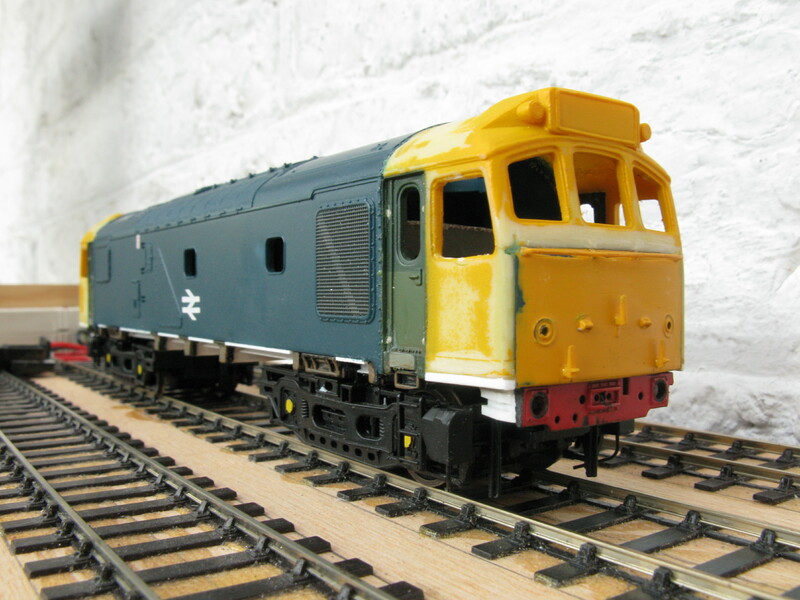 Also in the 1990s Silver Fox produced a resin body which I’m certain is just a Hornby/A1 conversion cast in resin. In more modern times Bachmann have produced a 25/3 but the cabs are the wrong shape so probably the only option for a good model is to use modified Hornby cabs (just file off the nose and open up the centre window) or Silver Fox cabs on the Bachmann centre section. I wasn’t looking to build another 25 but having taken a Bachmann and a Silver Fox body to Scaleforum this year to show the differences to anyone who was interested (not many were) I found myself getting itchy fingers and, without stopping to think it through properly, a razor saw soon had the cabs cut off both bodies and a big file made short work of truing them up so I could araldite the SF cabs onto the Bachmann body. At this point I looked at the fronts of the cabs and convinced myself the Bachmann one looked better so out with the razor saw and araldite again and soon the Silver Fox cabs had Bachmann fronts. By cutting just above the handrail I was able to dodge having to make a new ‘rail from brass wire and hide the join unobtrusively. The cab sides now needed extending down by 1mm to match the fronts but as I’d done this anyway on 25029 I didn’t feel the need to worry. 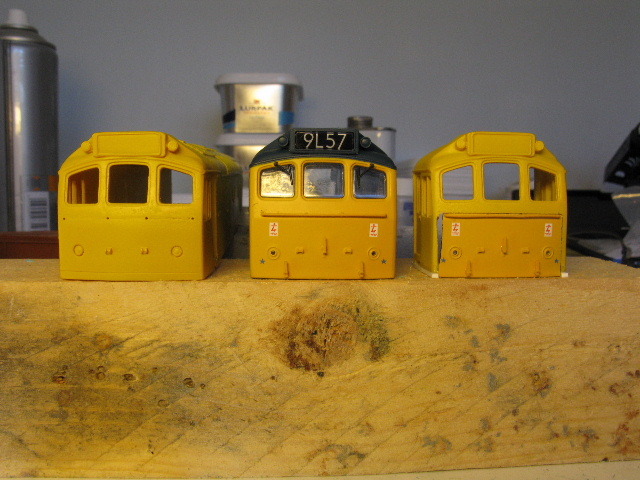 Below is a photo of a Silver Fox cab, a Bachmann cab and the Silver Fox cab with the Bachmann front inserted. The class 25, although rather plain and unassuming, was a hard working and reliable loco that got just about everywhere on BR and there can be few pre 1987 D&E era layouts that can’t justify at least one on the roster. Modelling these locos accurately in 4mm scale is sadly not as easy as opening a blue or red box and plonking said loco on the track. Hornby produced a model of the early bodystyle in the mid 70s and although the body is fundamentally the right shape it needs a bit of work to bring it up to date. The chassis and mechanism are typical of the times and are better replaced with something better. Bachmann have produced both the early and late body styles and sadly they are badly compromised by the windscreens leaning back at too much of an angle and the curve above the screen being too shallow. The chassis is also a bit ‘filled in’ and needs work but at least the mechanism is beautifully smooth. Jim Smith-Wright produced an article in the DEMU Update magazine back in 2007 on modelling the class and how to modify the Bachmann chassis to look more like a real 25 and this article is now available on Jims P4 New Street website http://www.p4newstreet.com/articlePDFs/25%20article.pdf I can recommend anyone looking to improve their class 25 to have a good read of this before starting. More recently Jim has updated his models further and James Wells has put his thoughts on modelling the class on his Eastmoor blog http://eastmoor.blogspot.co.uk/2013/09/project-25.html and on RMWeb http://www.rmweb.co.uk/community/index.php?/topic/68176-an-approach-to-modelling-class-25s-springy-bits/ Also in the intervening years Brassmasters, Shawplan and Penbits have brought out new products so that anyone can built a top drawer 25. 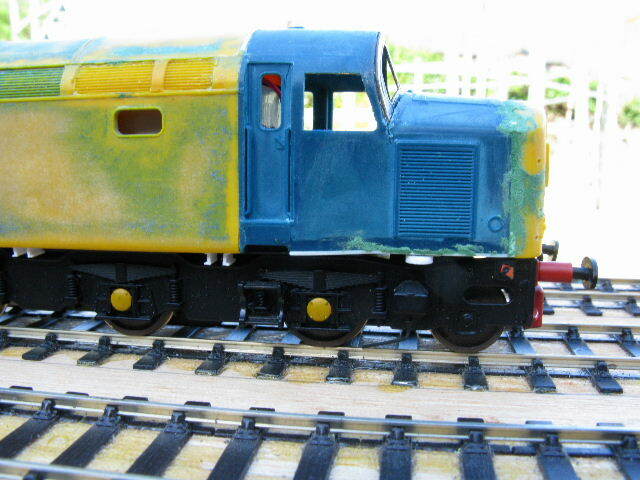 To model a 25 with the early style bodyshell with the grills on the bodyside the easiest way I can see is to use the Hornby body on a modified Bachmann chassis, as recommended by Jim. About five years ago I built a model of 25029 using Jims article and a few ideas of my own. I found I needed to add 1mm to the bottom of the cab and raise the nose by 1.5mm. Since then the general consensus has come about that although the nose may need to be raised a little it is the centre window that needs to be made deeper. I will look into this further if I built another early pattern loco. Longcarse West was my first and so far only attempt at building a model railway. I’d wanted to build one for many years but I didn’t like the narrow look of OO track and thought that the finer 4mm scale gauges were only for the elite who made all their track and stock from scratch, much too difficult for the likes of me. In the mid 2000s however I joined the local area group of DEMU who were in the final stages of building an EM gauge layout called Roundtrees Sidings. It was very inspiring to see how much better handmade track looked and so on a trip to the Nottingham exhibition I bought a C&L point kit, in OO as I still wasn’t quite ready to make the leap to wider, and found it fairly easy to build. A little later the Exactoscale P4 track and point kits came on the market and I came to the conclusion that if I was able and willing to build my own track I should really get the rails the right distance apart. It’s fair to say that Longcarse West wasn’t the best planned layout. I bought some plywood that fitted in my car and got to work building the first board 5′ x 18″. A handful of Exactoscale point kits, all A6s, were bought and manouvered around on the board till they looked about right which meant the second board had to taper from 18″ to 2′ wide so that I could avoid any reverse curves when shunting into sidings. It’s no great secret that the track plan is a slightly extended copy of Geoff Taylors EM gauge layout Alloa Goods. The fact that they are both set in the same location however is more of a coincidence. Longcarse Junction being the name of one of the junctions in Alloa. Longcarse West made it’s debut on the exhibiton circuit at Thirsk in 2008 and was exhibited around the country until Scaleforum 2011 and has now been sold on so that I can make a start on planning and building a new layout. Welcome to Waveydavey’s Model Muddle. My name is David Furmage and I mostly model in 4mm scale P4 gauge, usually set in 1975 in the Central Scottish county of Clackmannanshire. I built and exhibited the layout Longcarse West between 2008 and 2011. This was my first attempt at building a layout and although it was a success and proved that I could work to P4 standards I felt I could do better so it has now been sold on so that I can begin work on a new layout. 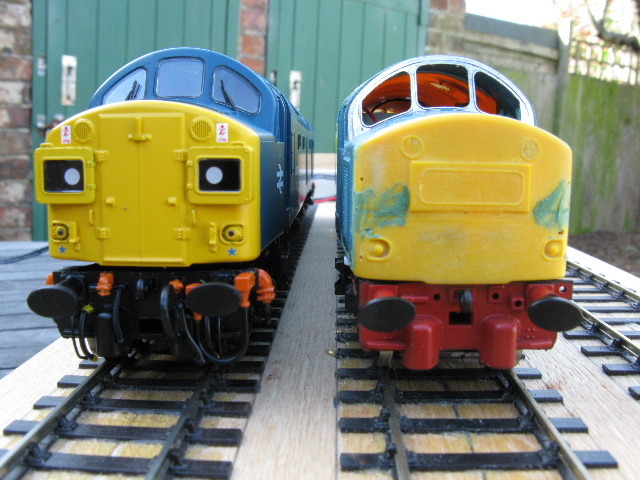 This will be my new modelling blog after finding I could no longer access my old one ‘waveydaveysmodellingblog’. Here you will see my amateurish attempts at modelling in P4 and the build of the new layout which is currently imaginatively titled ‘Longcarse West 2’. I’m also developing an interest in 7mm modelling so a little bit of that might crop up here and a small S7 plank may appear eventually. To keep you going until further content appears here is a link to my workbench thread on one of the old incarnations of RMWeb.